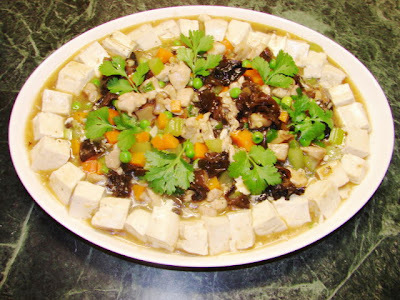 This tofu dish is a common cantonese home cooking. Simple, colourful and quite delicious. Once you have done all the prep and cutting, it only takes 5 - 8 minutes to cook. In a wok, heat some cooking oil till hot add ginger and garlic, stir till fragrant. Add chicken and wine and stir till brown. Add mushroom, cloudears/woodears and carrot and ½ cup of water, stir then cover and cook for about few minutes till tender. Add celery, oyster sauce, soy sauce, pepper and remaining water. Cover for another minute. Add peas and confllour to thicken. Then add enough sesame oil and pepper to taste. Cook till everything is piping hot stir in the spring onion. Turn the heat to minimum. Remove all the solids with a slotted spoon onto the middle of a large plate. Leave behind the gravy. You should have about 1 cup of gravy in the pan. If not add a bit more water, there should be enough gravy to cover the tofu. Turn the heat up and add the tofu pieces and cook till hot through. 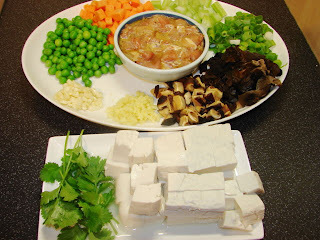 Carefully spoon the tofu piece around the dish. Any remaining gravy just pour over the dish. Sprinkle with a little bit more sesame oil on top to keep the dish shiny. Garnish with a few leaves of coriander if wish. * Suitable for vegetarian. For a vegetarian version, leave out chicken and marinate and add oyster mushrooms and/0r button mushrooms. You can have a variety of mushrooms mix. ** cloudear (雲耳) is not the same as woodear (木耳). Cloudear is smaller, thinner, dark and smooth on both sides. Woodear is much larger, thicker with one side which is smooth and black/brown the other side is sandy in colour with a suede texture. In this recipe I used cloudears.